‘I suppose it’s Barbara from Scarborough that we need to thank' says Claire Thornley AKA. 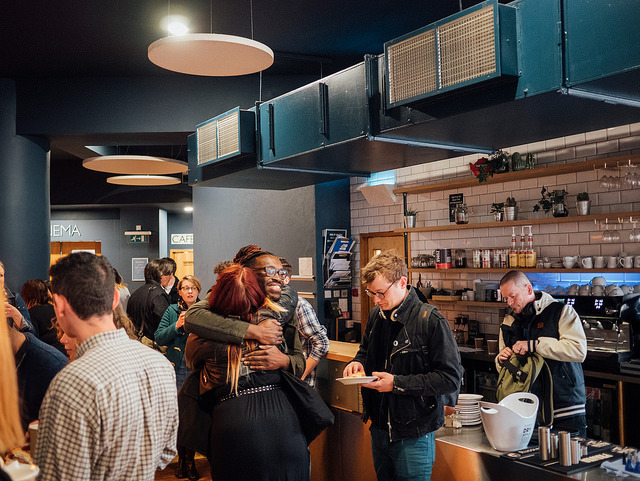 Our Favourite Places as she starts her talk on CreativeMornings’ May theme, #CMCommitment. Claire met Barbara when staying in the seaside town for a holiday. The B&B owner gave Claire and husband Glenn a scrap of paper, detailing her recommendations for things to do in Scarborough. The couple spent the weekend working through Barbara’s list, discovering the very best of Scarborough, according to a local. The words on top of that list? Our Favourite Places is a product of Eleven Design, the design studio run by Claire and husband Glenn. It was Eleven’s commitment to Our Favourite Places, that led Claire to the Ecclesall Woods to speak on #CMCommitmment. The venue for May’s CreativeMornings Sheffield is the JG Graves Woodland Discovery Centre. Nestled in Sheffield’s leafy suburbs, the centre is set within 142 hectares of ancient woodland and surrounded by a friendly community of craftspeople, rangers and volunteers. 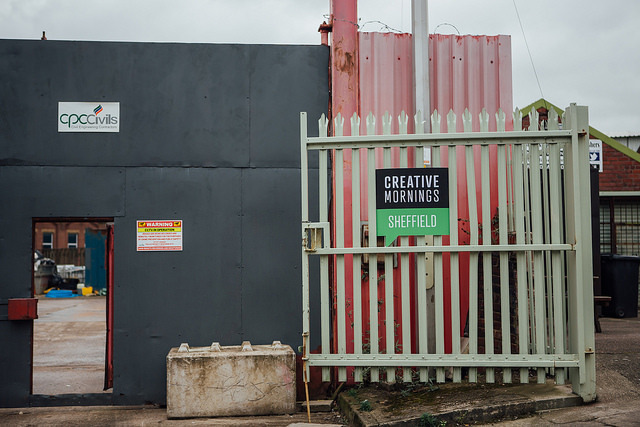 A beautiful, peaceful place for CreativeMornings Sheffield to call home for the morning. 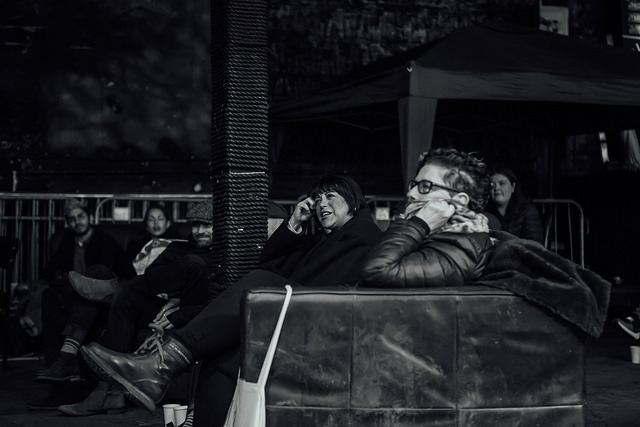 Claire and Glenn’s frustrations that the city wasn’t shouting about the fantastic things happening within its seven hills, first inspired Our Favourite Places, Sheffield’s culture guide. One guidebook became four, an Our Favourite Places guide to typography in Sheffield was listed as one of the best in Britain by The Guardian, then came website www.ourfaveplaces.co.uk, and an event, the now annual Sheffield Photo Marathon. 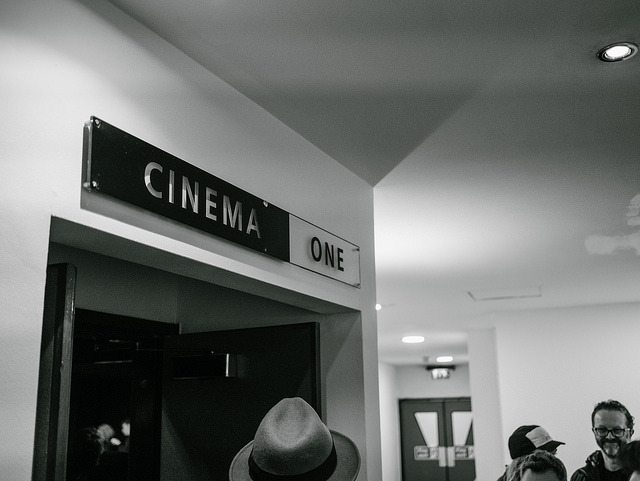 Alongside working with some of the region’s largest institutions and artists, having a baby boy, and helping to promote the city with the Sheffield Culture Consortium, Eleven remained committed to Our Favourite Places. Most recently a new website launched, and more exciting announcements are to come in 2018. A commitment is a promise to show up whether you’re having a good or bad day.It’s a behavior and mindset that signifies the posture of a professional. It’s about saying yes with your whole heart.A creative life is built on the commitments you make to projects and people. It can feel like a leap of faith. 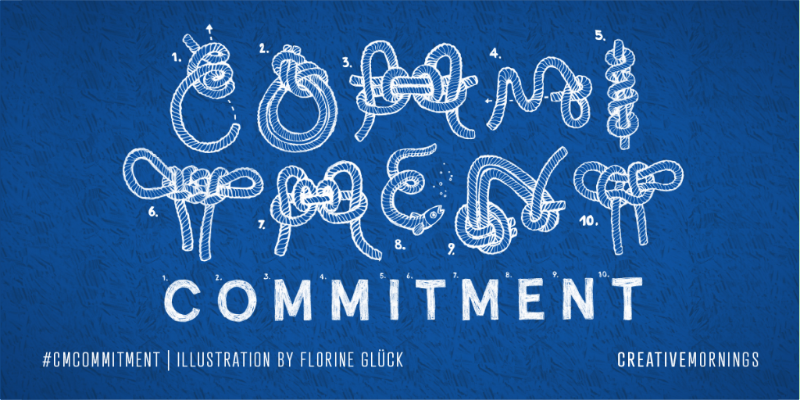 But is that not the very essence of leading a creative life?This month’s global exploration of Commitment was chosen by our Vienna chapter and illustrated by Florine Glück. 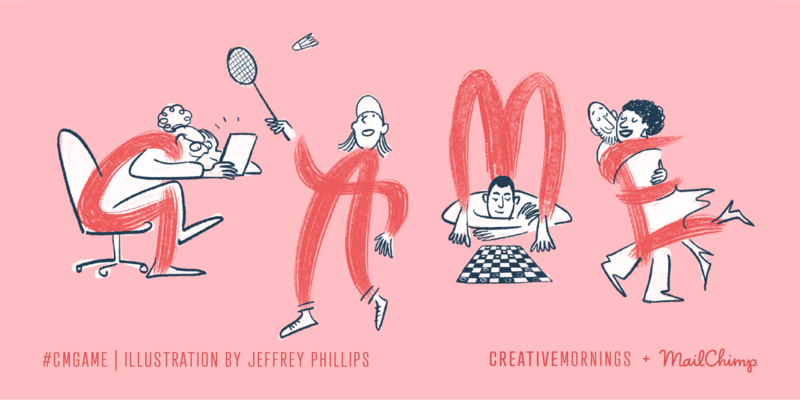 Thank you to our global partners MailChimp, Adobe, and WordPress.com for their ongoing support of the CreativeMornings community. CM Commitment with Claire Thornley AKA. Our Favourite Places. See all the photos from #CMGame on Flickr. 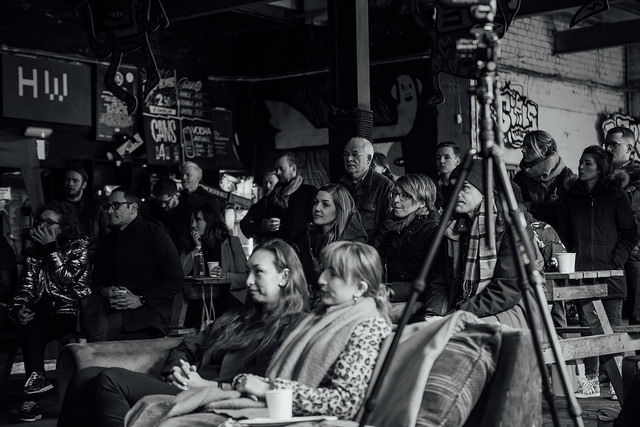 With just six weeks to go until the 25th edition of Doc/Fest, Sheffield’s international documentary festival, kicks off, Sheffield’s creatives gathered to listen to Liz McIntyre AKA festival director and CEO of Doc/Fest, speak on CreativeMornings’ April’s global theme, CM Game. 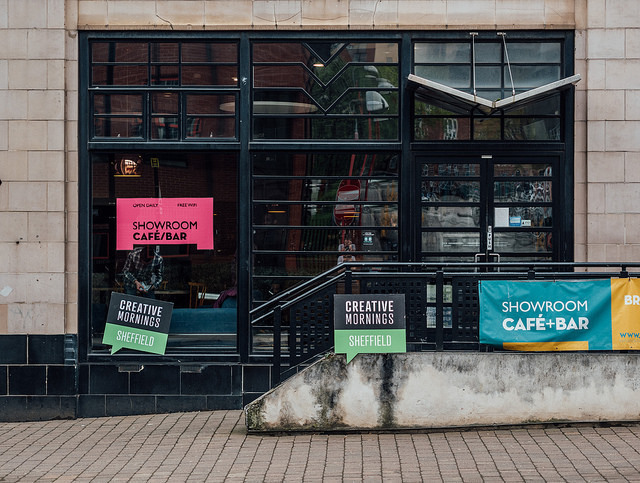 This morning, CreativeMornings Sheffield is calling The Showroom cinema home. One of the city’s last remaining art deco buildings, The Showroom began life as Kennings car showroom in 1936. After Kennings closed four decades later, it wasn’t until the 1980s and 90s that the building found a new purpose as the Sheffield Media and Exhibition Centre, and The Showroom Project was born. For Liz, the word game can mean five things: 1. Activity for fun. 2. Competitive sport, played according to the rules. 3. A period of play, ending in a final result. 4. A secret or clever plan or trick. 5. Being eager to do something new or challenging. Working through her definitions, Liz explains where her fascination with documentaries came from. Her teenage years were spent in search of role models with experience that extended beyond her own home, and Liz found her inspiration in other peoples’ stories. When Liz’s family faced their own adversity, she realised that the lives of others are often not what they seem, and a spell as a penny-a-line columnist in a village paper helped her find the joy in all stories, no matter how big or small. For Liz, telling stories in print turned into telling stories through film, making films including The Lost Children of Berlin, No Place Like Home, Dangerous Love and Five Steps to Tyranny. She then moved into commissioning for The Discovery Channel before taking on her role at Doc/Fest. For the 25th edition of Doc/Fest, Liz and her team are expecting thousands of delegates from the film industry and thousands more members of the public to attend events across the city. 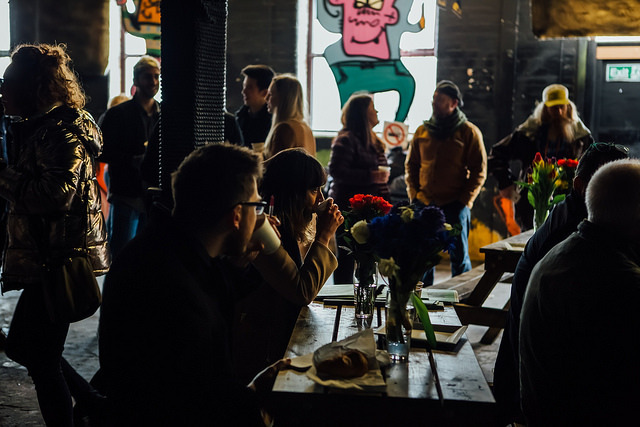 Trafalgar Warehouse will play host to free AR and VR activities, cinema screens will pop up and talks from the likes of Vicky McClure, Guy Martin and Mark Cousins are already close to selling out. 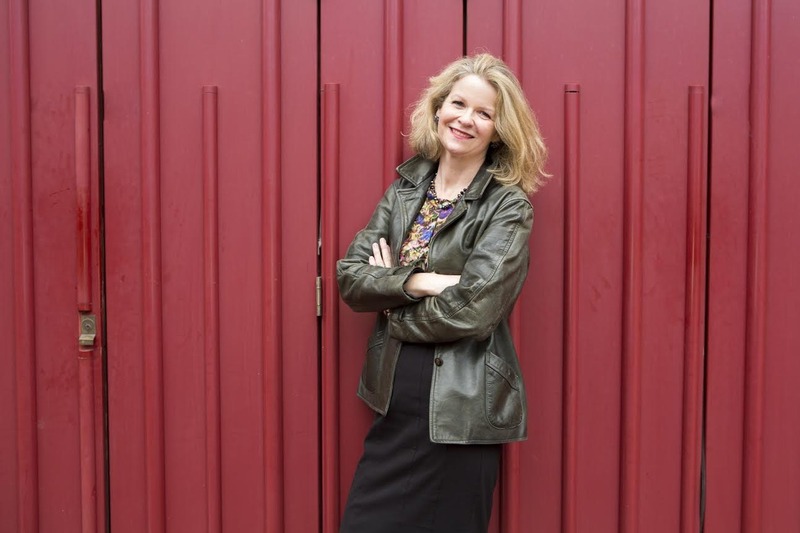 Liz McIntyre AKA. 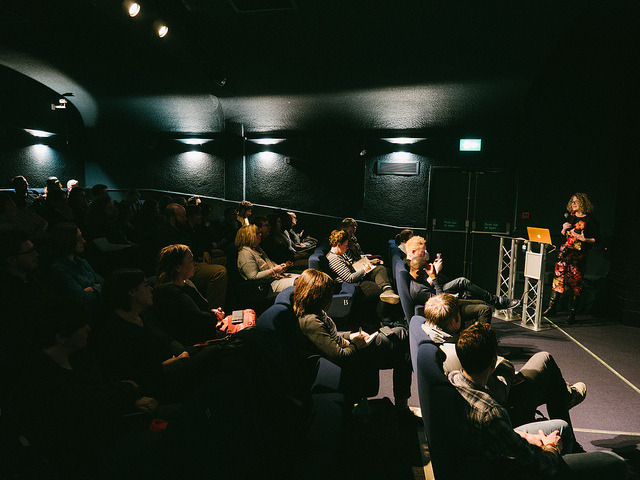 Festival Director & CEO Sheff Doc Fest talks #CMgame this month at the Showroom. See you there! April’s theme is GAMEThroughout human history, games were about winning or losing.Author James P. Carse extends this concept beautifully in Finite and Infinite Games: “A finite game is played for the purpose of winning, an infinite game for the purpose of continuing the play.”Which game are you playing with your art?It’s a question worth asking everyday. Is this decision, this attitude, sending you down a short game or long game? The same energy that we spend chasing rewards and likes can be refocused to loving our craft and shipping our best work.Keep your eyes on the journey, not the prize.This month is presented by our global partner MailChimp. This month’s global exploration of Game was chosen by our Liège chapter and illustrated by Jeffrey Phillips. 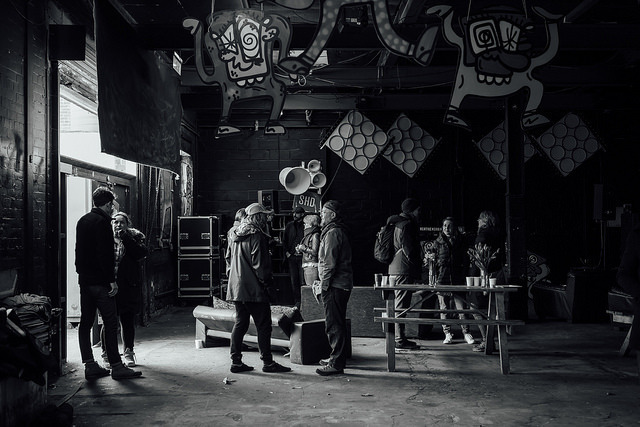 The early morning sun usually signals the end of a night at Hope Works, one very special warehouse venue on the outskirts of Sheffield city centre. 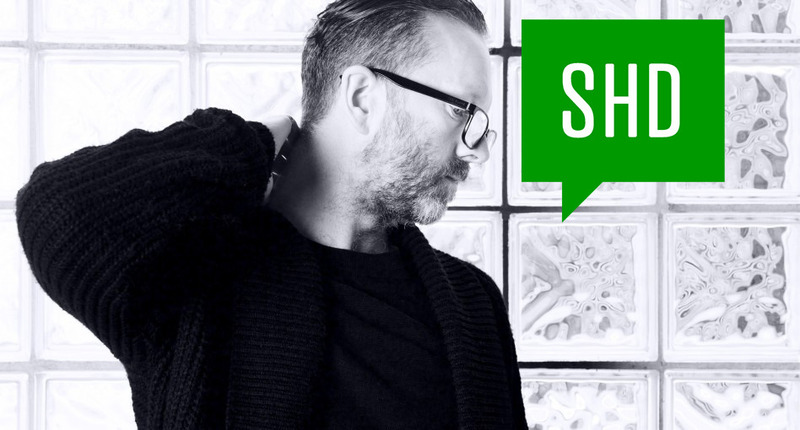 But today, things are slightly different, people are arriving at 8:30am for CreativeMornings Sheffield, to listen to Liam O’Shea AKA Hope Works talk on #CMCourage. 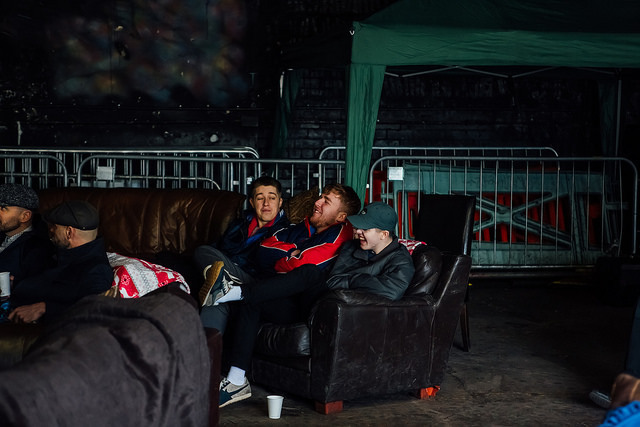 Running a venue was never really part of the plan for Liam, who has been involved in Sheffield’s music scene under various guises since the 90s. He wanted to be a rockstar. An ambition that could transport him away from his upbringing on a Nottingham estate. First, he picked up a guitar and played in bands, before going solo as a singer-songwriter, following that came projects in hip-hop and jazz and then Liam turned to the decks. Today, as well as running Hope Works, Liam DJs under the alias Lo Shea. “In my life, I had done lots of things and nothing had really gone anywhere on the surface. Back then, for me ‘going somewhere’ was having money and success,” says Liam, who is honest about struggling with what he deemed as failure and though partying all the time, wrestled with depression, drugs and alcohol. He soon realised it was time to make a change. 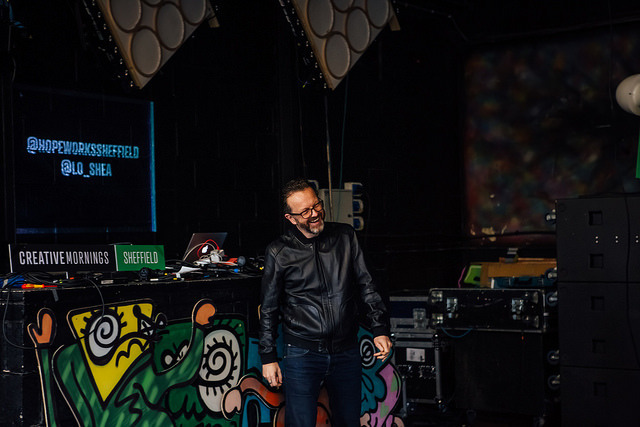 In 2009, Liam started another new project – Mixed In Sheffield - with the aim to explore, reveal and celebrate the diversity of electronic music in Sheffield. From an initial 98 minute mixtape featuring 41 of Sheffield’s electronic artists Mixed in Sheffield grew, became a record label and threw sell out parties at venues across the city. In 2012 Mixed In Sheffield found a permanent home. 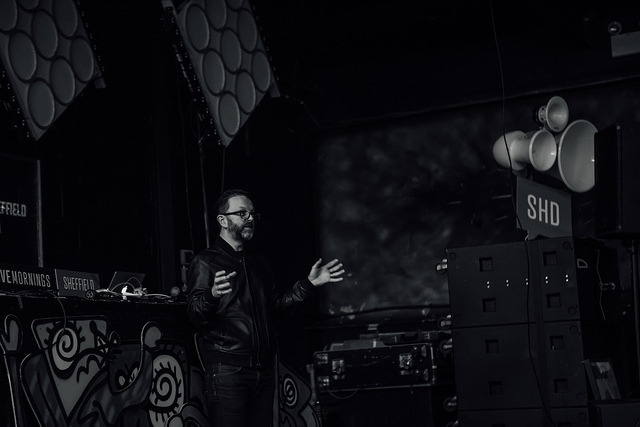 In five years, Hope Works became an integral part of Sheffield’s electronic music community, and in 2017, became the main venue of No Bounds festival. 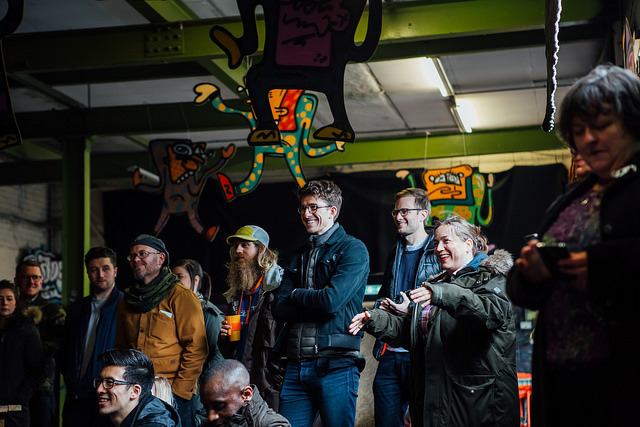 A three-day, city-wide festival of music, art and technology that received rave reviews in the press and put Hope Works on the map globally, linking to similar, larger festivals across Europe. The future is bright for Liam, Hope Works, and the next generation of musicians and artists that the venue provides a platform for. No Bounds will make a return in October 2018, and the venue has some stellar parties planned for the year ahead. But from Liam’s honest and raw account of his story so far, it’s clear it’s taken a lot of courage to be where he is today, and he couldn’t have done it without the support of his community, or learning which projects to let go, and which to pursue. “Letting go is a scary process. Especially if you’ve defined yourself by that thing for all your life. It is incredibly scary. Liam will be getting up early and talking #Cmcourage with us at the Hope Works warehouse Friday March 23. Registration opens Monday 19th. Hope to see you there. March’s theme is COURAGEThis month is presented by our global partner WordPress.com. 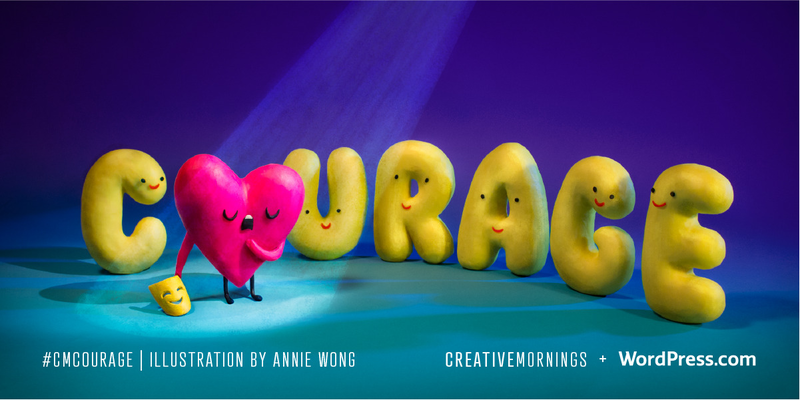 This month’s global exploration of Courage was chosen by our Oakland chapter and illustrated by Annie Wong.We’ll be exploring this theme alongside 180+ other CreativeMornings chapters in March.